38 - $134.99 Only 3 left! 40 - $107.99 Only 6 left! 42 - $134.99 Only 2 left! 44 - $134.99 Only 1 left! The fashion industry has devoted a wealth of attention to crafting outfits that can blend the work day with the night life, though such focus has usually been granted to our refined lady half of the population. That leaves a lot of guys rushing home after the day at the office to change from the business suit and tie and into more festive clothing for the after hours celebrations. So, what is a guy to do when he wants to make that stylish mark at the office and also shift easily into a relaxed celebration afterwards? Well, we can see exactly what you are thinking!Skulls! It is truly a brilliant idea and we’re glad that you came up with it. 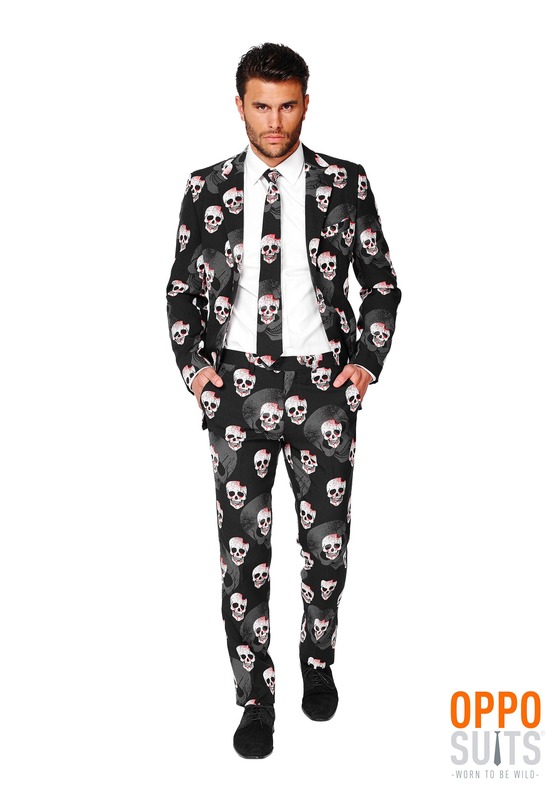 Some might ask, “What kind of man wears skulls to the office! ?” Obviously the answer is a stylish, sophisticated, debonair kind of guy that knows exactly how to get the party started. 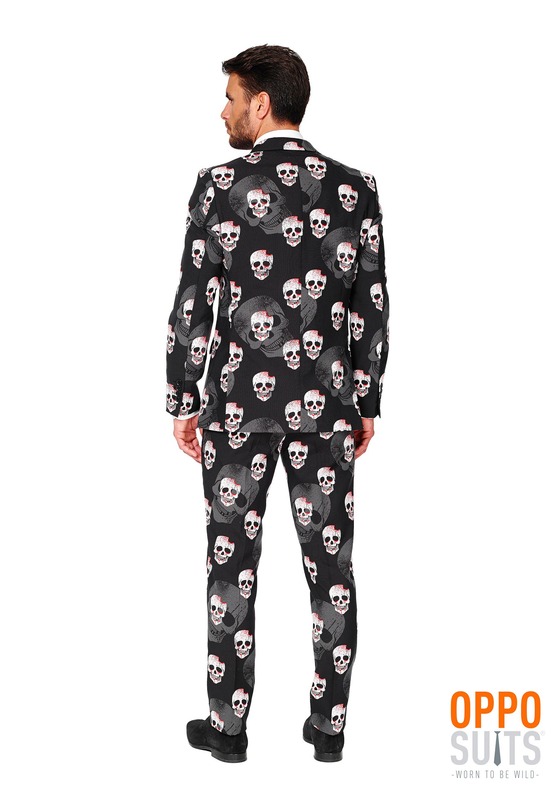 The Men’s OppoSuits Skulleton Suit is the perfect answer for the man looking for a sleek alternative to the Halloween costume while still upholding his trendy and professional look. 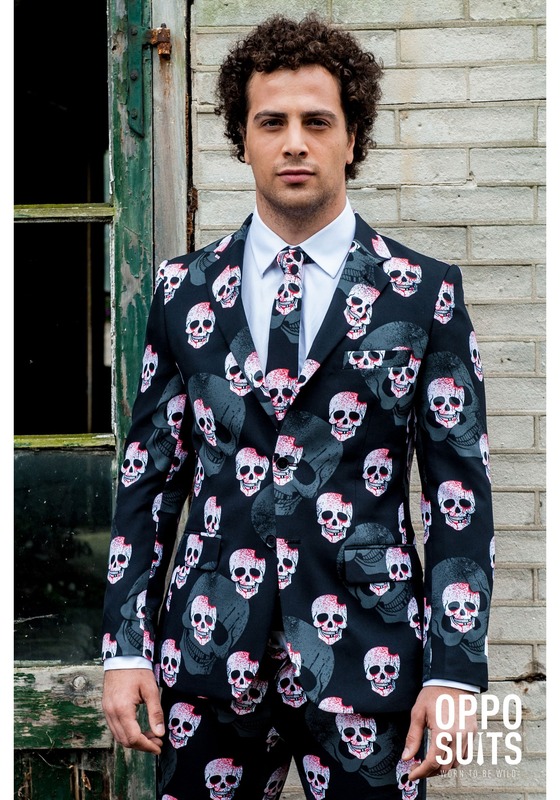 Complete with a fully lined suit jacket and a matching neck tie with the spectacular skull design, you can be sure that no one else will have the same suit as you! All suits are set up for easy modifications should your nuanced fashion sense send you to a tailor for alterations (and, believe us, that tailor is going to talk about your style all year). Don’t miss a minute as you move easily from day to night as you conclude the year right with a look that can’t be replicated.